Floating Floor vs. Nail Down | Slaughterbeck Floors, Inc. When most people think about installing hardwood flooring, they typically envision a hammer, nails, and lots of backbreaking work. Choosing which hardwood floor installation method depends on the flooring type used, whether it is installed above or below grade and the subfloor material. The word grade references what level of the house the floor is located. The second floor of a home is above grade, ground floor is on grade, and basement level is below grade. Only certain types of flooring should be installed below grade or on a cement foundation. Nailing down hardwood floors is the most common installation method, especially for solid flooring. The process involves nailing the flooring directly to a wood subfloor. Typically, the flooring is “blind nailed” through the tongue (a portion of the wood plank that protrudes from the board and fits into the groove of the adjacent board). With this method, the nails are nearly invisible after installation. This method works for solid and engineered floors, but only with a wood subfloor. 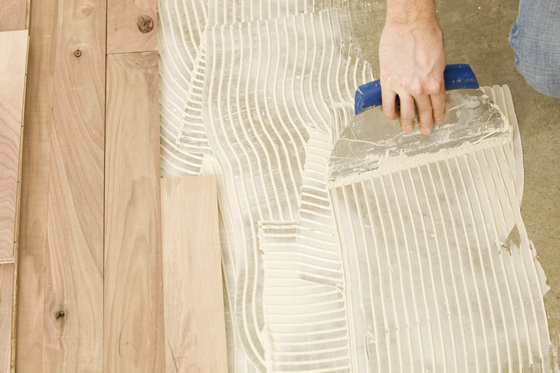 The glue down method involves using adhesives to adhere the hardwood flooring to the subfloor. 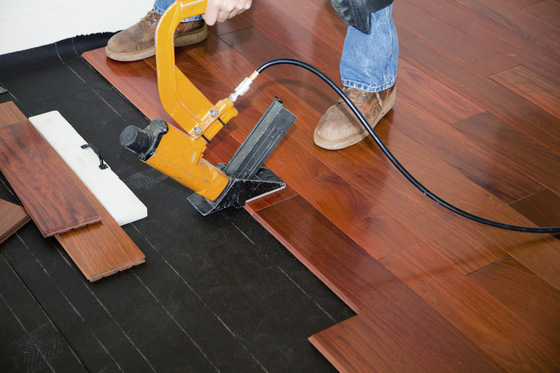 Adhesives work by creating a bond between the subfloor and the wood flooring through a chemical reaction process. Using this method, the flooring is neither nailed nor glued to the subfloor, but floated above it. The flooring, usually engineered, is glued or clipped to itself, tongue to groove, and at the end joints. This gives the floor stability without actually fastening it to the subfloor. This installation method is ideal over floors such as tile, which can be difficult to remove. This method is also good over cement subfloors and floors with radiant heat. 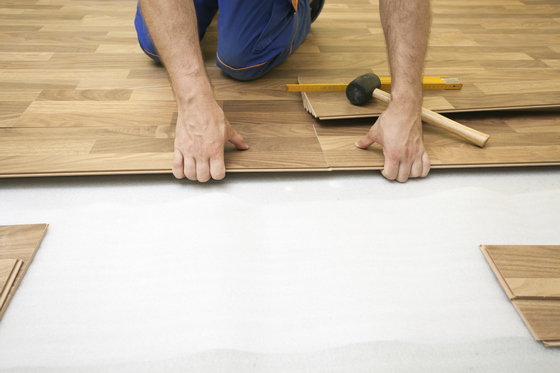 Before beginning a floating installation, the subfloor is checked for dryness and levelness. Any high or low spots must be leveled prior to installation. A plastic moisture barrier is laid on the subfloor prior to installation of the flooring.